HOW CAN I BECOME A MEMBER OF SPENCER'S SMART REWARDS PROGRAM? Please fill in the registration form accurately and in full and drop it in the drop box placed right behind the cash till or handover it to the cashier at the program desk in-store (program desk in Spencer's Hyper only). IMPORTANT: If your registration form is not complete or the cashier has forgotten to scan the barcode on the Registration Form at the cash till at the time of issue then your membership account will not get activated and you will not be able to either track your points status or redeem any points that you might have accumulated while shopping at Spencer's. All current HSBC Spencer's card holders can use their HSBC Spencer's card in the same way that they have been using till now. Please remember to fill in your mobile number in the registration form to enjoy the benefits of the Program. Track your points earned, points redeemed, and points balance. Submit lost card requests or ask for a points e-statement. Please remember to change your password the first time you log in. *Conditions: Minimum shopping limit to be eligible for program membership varies from store to store. Spencer's SmartRewards card is a bearer's card. In case it gets lost or misplaced please call 18002660134(toll free, operational 8 a.m. to 10 p.m. on all days) to block the points redemption immediately. Spencer's will not be liable for any points redemption if you do not block points redemption on your card or if the points are redeemed before you block your card. WHAT WILL I GET BY PARTICIPATING IN THIS PROGRAM? By participating in the Program you start earning points for every purchase you make at Spencer's. That's not all you start earning points from day 1 of applying for registration! To earn your points, just hand over your SmartRewards card or quote your registered mobile number to the cashier every time you shop at Spencer's. Additionally, Spencer's will launch exclusive promotions for Program members from time to time which you can take advantage of. Such offers when launched would be communicated to you either in Spencer's stores or though the contact information you have submitted at the time of registration. Points will get transferred to your account within 7 working days of your billing. E.g. if you shop at Spencer's on August 15, 2010 then points for this billing would get transferred to your account by August 24, 2010. Points are earned if you purchase in multiples of Rs.100 only e.g. if you have billed Rs.175 then you will only get 10 points for the first Rs.100 you have spent. In this case, it would be better to purchase a small amount more to bring your total billing up to Rs.200 and earn 20 points instead. Points are earned on the net invoice amount paid (amount paid after any deductions that may be applicable). For points expiry rule please refer to the Terms and Conditions section. Other Spencer's SmartRewards Program conditions apply. In order to be rewarded with points on a purchase, you may give your card to be swiped or quote your registered mobile number to the cashier at the time of billing. No manual entry of your card number at the cash till is allowed. WHAT CAN I GET THROUGH THE POINTS I HAVE ACCUMULATED? HOW DO I GET POINTS IF I HAVE BEEN HANDED OVER A HANDWRITTEN BILL? Points will be transferred to your account within 10 working days from the date of request. In case you find points have not been transferred kindly call us at 18002660134 (toll free, operational 8 a.m. to 10 p.m. on all days) or email us at customercare.spencers@rp-sg.in. Our customer service team will be happy to resolve your queries. Simply hand over your card to the cashier at the time of billing or quote your registered mobile number, and confirm to the cashier the number of points you would like to redeem. The cashier will redeem points on your behalf and hand over a charge slip as a confirmation of points redemption. Any redemption performed by the cashier at your instructions cannot be cancelled or altered or amended at any point in time. Points redemption is possible at the time of purchase only. HOW WILL I KNOW THE NUMBER OF POINTS I HAVE ACCUMULATED OR REDEEMED? Call us at 18002660134 (toll free, operational 8 a.m. to 10 p.m. on all days) and ask our customer care executive about your points status. WHEN WILL MY SPENCER'S SMARTREWARDS CARD NOT GET ACTIVATED AND WHAT IS THE DISADVANTAGE OF HAVING A CARD WHICH HAS NOT BEEN ACTIVATED? If you do not fill in your registration form in full at the time of registration your membership account will not get activated. If the cashier does not scan the barcode in your registration form your membership account will not get activated. You cannot redeem your points. Also, you won't be able to view your account and points status on the website. If you find that you have a membership account which has not been activated call us at 18002660134 (toll free, operational 8 a.m. to 10 p.m. on all days) and customer care will guide you to get it activated. Please give us a week from your request date to activate your membership account in such cases. All points accumulated for a membership account will expire on 28th February of every year. WHOM SHOULD I GET IN TOUCH WITH IN CASE I HAVE ANY QUERIES OR IF I WANT TO REPORT A LOST CARD? 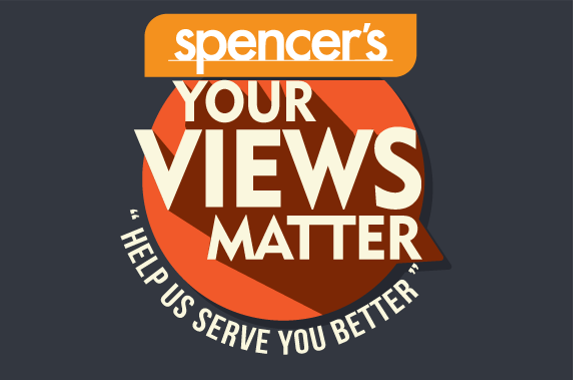 Please log on to www.spencersretail.com and submit an online request, call us at 18002660134 (toll free, operational 8 a.m. to 10 p.m. on all days), or write to us at customercare.spencers@rp-sg.in mentioning your card number and we will get in touch with you. In case you require any further assistance regarding the Program, need more information, or wish to inform us of any change related to mobile number/address, other details, or loss/damage of card, write to us at customercare.spencers@rp-sg.in mentioning your card number or call us at 18002660134 (toll free, operational 8 a.m. to 10 p.m. on all days). Our customer service team will be happy to resolve your queries. WHAT DO I DO IF I MISS/FORGET CARRYING MY CARD TO THE STORE AT THE TIME OF SHOPPING? Log in Online- Please login with your user ID and password to and give a request for manual points updation. Call Customer Care- 1800 266 0134 (toll free) and give a request for manual points updation. For both of the above process- Bill number, till number, Smart Rewards card number or registered phone number, bill date and store name would be required.